I don’t know what it is, but when I am home alone and my wife and kids are out running errands, I decide to make something a bit naughty. I mean naughty in the sense where I don’t need a comment from any of the family members such as ‘gross’ or ‘what the heck is that?’. This was one of those times. A can of sardines and I have been having a stare down for some time now. You know that can I’m talking about. That can you quickly go past when shopping at the store. Not me. Those cans are something I take a look at carefully, and actually loved those darn little smoked oysters years ago, especially when served on a cracker. Sardines are no exception to that. You can buy an array of sardines in a can, whether they are boneless and skinless and packed in oil, or mustard, or tomato sauce. For me, I like mine packed in olive oil, and I could not care less whether they are boneless or skinless. 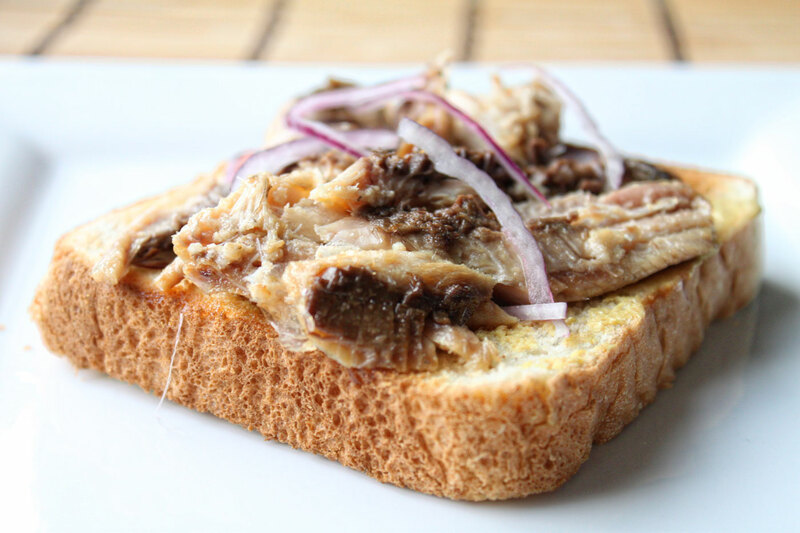 So as I sat alone, and hungry on a Saturday morning, I decided to win that stare down and come up with a pretty darn good open-faced sardine and onion sandwich. If you are scared of sardines, don’t be. Preheat your oven to 350 degrees. Upon the preheat, add the sardines to a oven safe plate, and place in the oven during the preheat to warm through. Place your bread in the toaster. When the bread has toasted, remove it from the toaster and slather on the Dijon mustard, from edge to edge. Place on half of the sliced onions on the mustard. 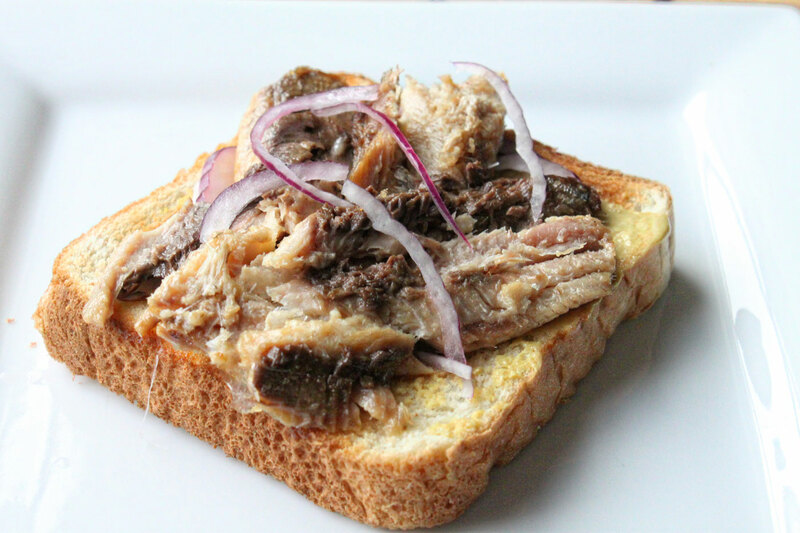 Remove the sardines from the oven and arrange them on the toast. 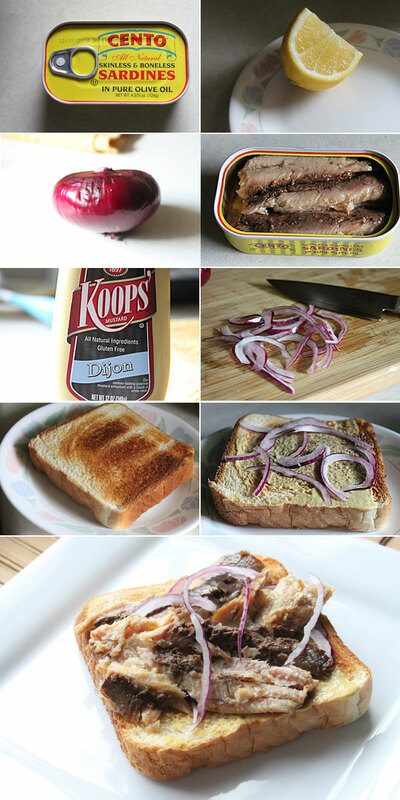 Place the remaining onion onto the sardines, and squeeze a bit of lemon over the top. Was this sandwich good? Are you kidding me? It was so satisfying. The sardines themselves lend the flavor and texture of what you might expect from tuna, but possibly better in this case. The slight bite of onion along with the tangy lemon and mustard made every bite memorable, especially with the crunch of the toast. Did I mention how good sardines, in moderation, are good for you? OMG, Dax, you have done it again! This is one of my all-time favorite quick meals. Sometimes I vary it with 2 slices of fresh sandwich bread, untoasted, no mustard, and a whole thin slice of Walla Walla Sweet Onion. Instead of sardines, I get these tiny smoked sprats from Latvia in a round, flat can with a black label. Sometimes these are in grocery stores with an ethnic section, but I can always find them at a Russian store. They are really tiny and quite smoky. Thanks Janet! I’ll have to look around for those smoked sprats as they sound really tasty.